The site is located at 300 meters from Tokyo Bay. This apartment building stands on a wholesale block marked by the urban grid on the land that had been reclaimed 50 years ago. Located in close proximity to the sea, it is our top priority to protect the building from strong sea breezes and salt damage. Selected materials are concrete and glass only, without corrosive materials such as steel and stainless steel. 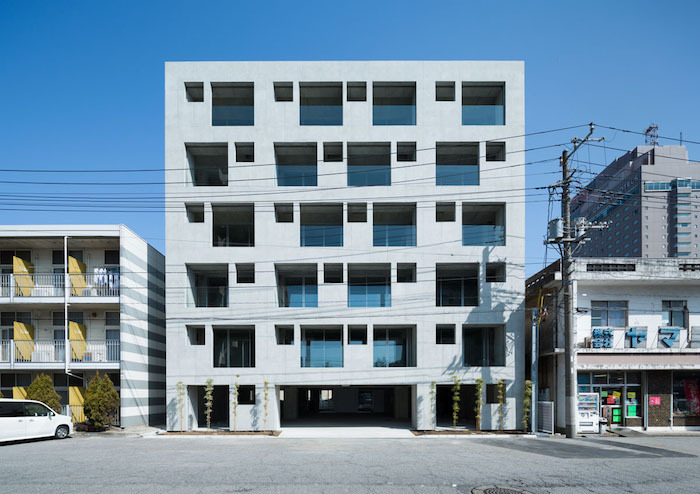 The building consists of housing units sandwiched between four walls made of concrete and glass. Construction joints of concrete are erased so that expression of materials is emphasized more. There are three housing unit types, and each unit is designed to be adaptable to different life styles of residents.